The best dining experience, you have to go! 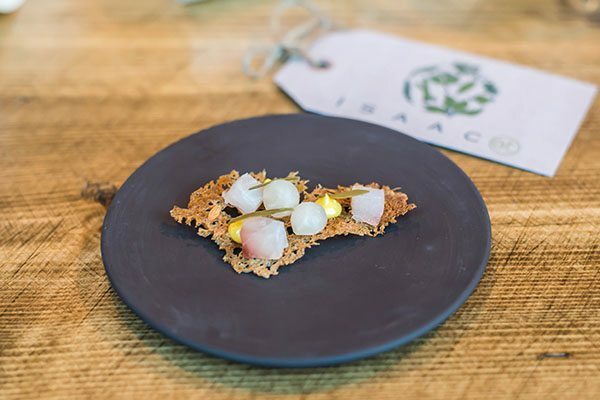 Isaac At is all about the ingredients and an interactive dining experience. The concept around it is: locally sourced, seasonal produce with big flavours using modern techniques. 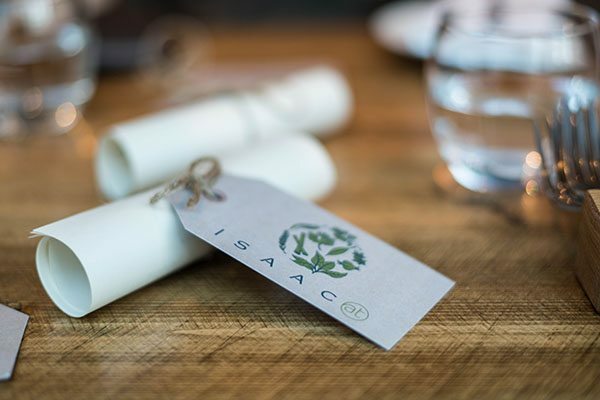 The seasonal set menu (which consists of around seven dishes) changes weekly depending on what’s readily available from local food purveyors, therefore there’s a close connection between Isaac At and its suppliers. August was a busy time for Isaac and his team with their renovation and in September they hosted their re-launch. The idea for the renovation was to create a more homely feel and to maximise the space, and they’ve really done a good job here for a small space to work with. 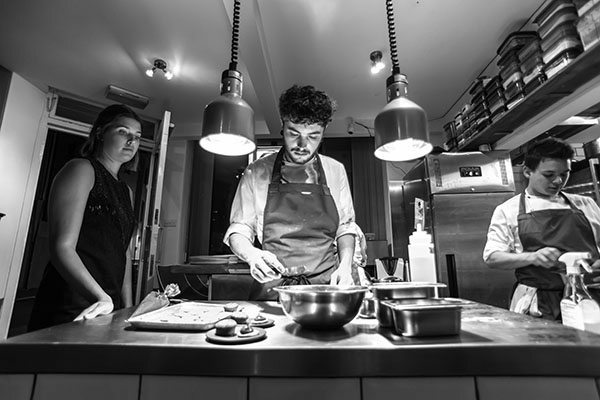 As soon as you enter the light and airy restaurant you see the chefs at work, the kitchen is very much a focal point of the restaurant and not hidden away. Isaac At are so passionate about the process of the food that there are two TVs in the dining area where you can see your food being plated up. This was a really interesting aspect to the restaurant and I enjoyed watching the empty plate being adorned with beautiful ingredients creating a artistic dish of food. 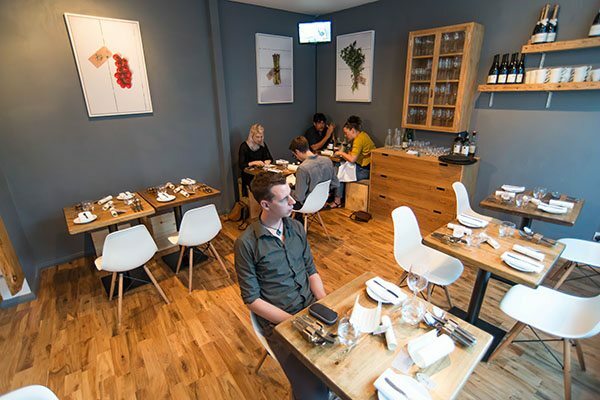 The restaurant has been decorated in a minimal style that doesn’t feel sterile, it’s got fantastic natural light and artwork on the walls shows simple food ingredients. Another thing I liked when I was seated was that amongst the menus, which had been presented like a scroll (which added a bit of theatre to the experience) was a mileage menu. 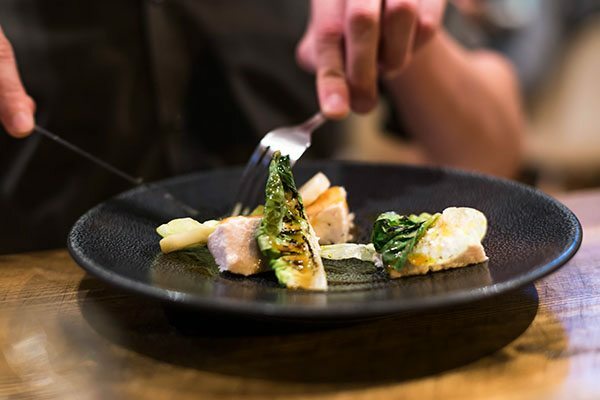 You could actually see exactly how far your plate of food had journeyed to get to you with all of the ingredients listed with where they came from and how far they travelled, some of which had been foraged by Isaac and his team! We were offered to try a flight (sample) of either the Sussex juice pairing or Sussex Alcoholic pairing for each dish and quite liked the sound of the juice so went for that. Our waiter had handmade the juices himself so was very knowledgeable on the subject. As an appetiser we were brought a bite sized crispy rye bread croute topped with salted mullet, pickled kohlrabi, rapeseed mayonnaise and sea parsley. I hadn’t heard of kohlrabi before. In case you haven’t either, it’s a seasonal vegetable which name translates to ‘turnip-cabbage’, it has a mild flavour and made a complementary addition to the dish. The rye bread croute had a good snap as you bit into it and I loved the presentation, it looked like a little country and the black unglazed dish really worked with it’s appearance. It was a striking start to the evening both in aesthetics and flavours. To follow we were given a small wooden chopping board with a selection of tear-and-share style breads and two handmade butters. 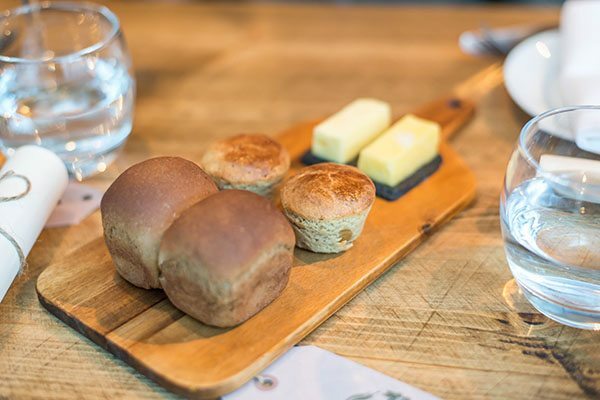 There was a treacle and stout mini loaf and a shallot mini bun, these were both light and slightly sweet that married well with the salty butter that was served alongside. The other butter we were told had been smoked which you could pick up slightly. The juice we were given to sample was a very light play on a virgin Mary, the flavours of tomato, red pepper and celery were coming though but it didn’t have the thick consistency of tomato juice. It was lovely and refreshing. It was amazing to see how much attention to detail had been put in through every aspect of the Isaac At experience. Our first course was Roasted Butternut Squash, Yeast Extract, Seeds & Rosemary Oil. We could see it being prepped on the TV screen, it was exciting to see it being plated up and the techniques used for the presentation. It was a dramatic looking plate with a big orange splat of squash puree that the slice of roasted squash sat on. 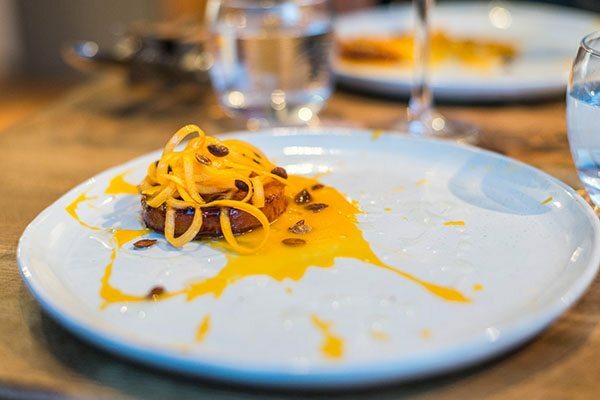 The plate was a celebration of butternut squash and it had been served as a puree, roasted and spiralized. The first thing you smell when it arrives is the familiar marmite smell coming from the yeast extract, as a lover of marmite I couldn’t wait to try it! It was a sophisticated looking dish using simple ingredients which tasted delicious, the toasted seeds added a nice bite to it too. The yeast flavour wasn’t overpowering, it gave the dish another dimension for the palate to experience. It was an inspiring dish with fantastic flavours for its modest ingredients, I’m going to attempt making a similar dish at home! We were given a sample of the cucumber and pear juice, which was another light juice that cleansed the palate and a nice introduction to our next course which also entailed cucumber. 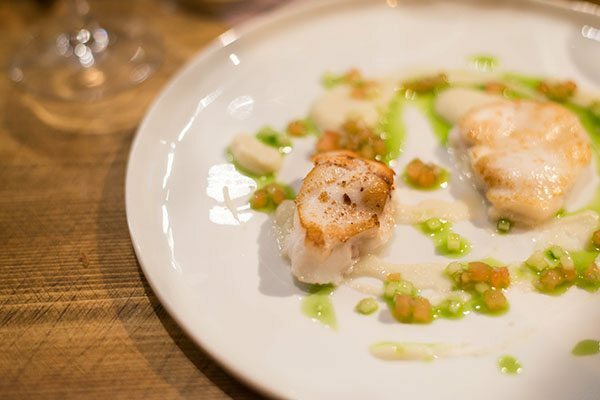 Monkfish, Cauliflower and Sauce Vierge was written on the menu, when it arrived it looked so delicate, but the monkfish was actually a really meaty fish which had a subtle smokiness from the browned edges. 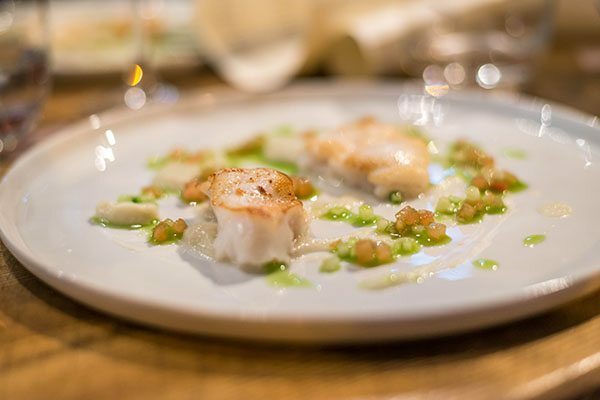 The cauliflower puree had the perfect amount of saltiness to season the dish and the sauce vierge was made of cucumber and tomato which was a refreshing addition to the rich flavours of the dish. A meaty fish with a creamy flavoursome puree balanced with a light and fresh sauce, it was perfect! Shortly after we finished our monkfish we were given a sample of a very rich coloured juice. It was a deep purple and when you swilled it around in the glass it almost has the resemblance of blood! The flavours were as strong as it looked, earthy beetroot with pear and a slight tartness coming from apples that had been handpicked from Isaac’s mum’s garden. It really went well with the Crispy Pork Belly and Smoked Broccoli. We were informed the pork had been aged for three straight days, it was so tender and ample in flavour, the crackling perfect. 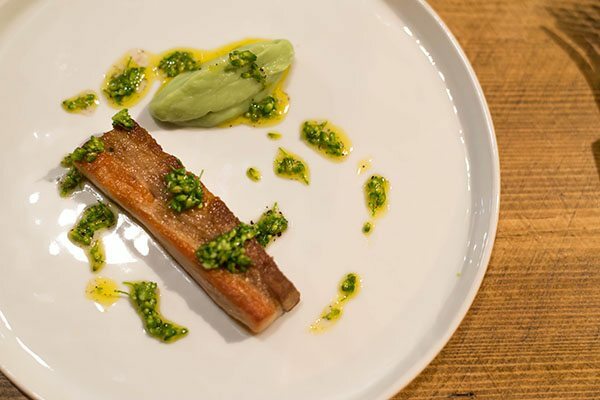 There was a buttery broccoli puree and a sweet and salty vinaigrette style dressing that was dotted around which broke up the heaviness from the fatty pork and creamy puree. They really do know how to balance flavours at Isaac At! The Roast Chicken, Salt Baked Celeriac and Gem Lettuce was our next dish and the chicken was the most succulent, moist chicken I’ve tasted. The juice that had been paired with this dish was a apple and blackberry, both of which had been handpicked by the Isaac At team! The chicken had been prepared using the sous vide method where the chicken is vacuum packed and put in a water bath for a period of time, thus not letting any flavour escape. 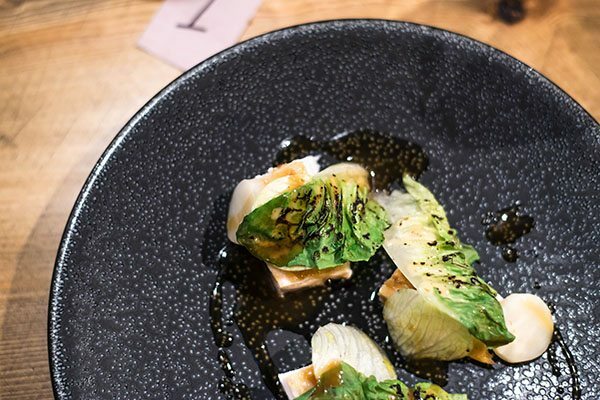 The skin was salty and crispy, the celeriac was subtle and added texture to the dish and I loved the charred gem lettuce, this was all drizzled in a gravy that had been made from the bones which brought everything together in the mouth. After my tastebuds were dancing around from all of these flavours they were in for a sweet treat, we had a raspberry and strawberry juice which was tangy and full bodied, perhaps my favourite juice, and this was paired with the sorbet, which was Hand Picked Blackberry and Cucumber Sorbet. This was a beautiful palate cleanser, sweet and refreshing, there was some crunch from little pieces of sweet ice that ran through it. 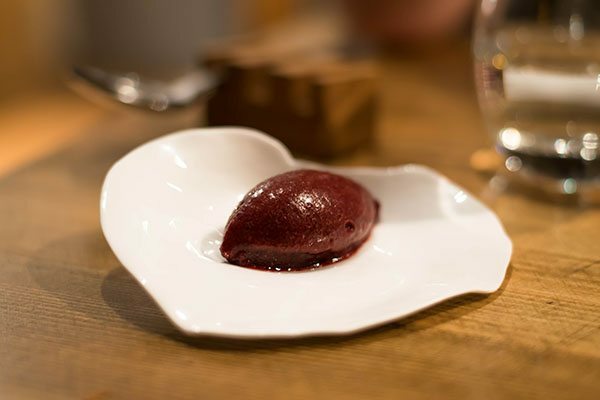 I especially loved with presentation of this, it came in a ceramic dish in the shape of a shell and the quill of sorbet looked like a plum coloured pearl. This dining experience just kept getting better! In between we were given an apple and honey juice; both ingredients coming from Brighton, in fact the longest distance any ingredient had travelled in the whole menu was the sugar which had travelled 120.1 miles from Petersborough. This seems a short distance compared to the produce sold in supermarkets! The juice however, wasn’t too sweet and I loved the sweet and sour combination from the slight tart (locally foraged) apples. The perfect end to the meal was a play on the classic Eton Mess, it was Strawberries, Honey, Pink Peppercorn Ice Cream and Milk Foam. 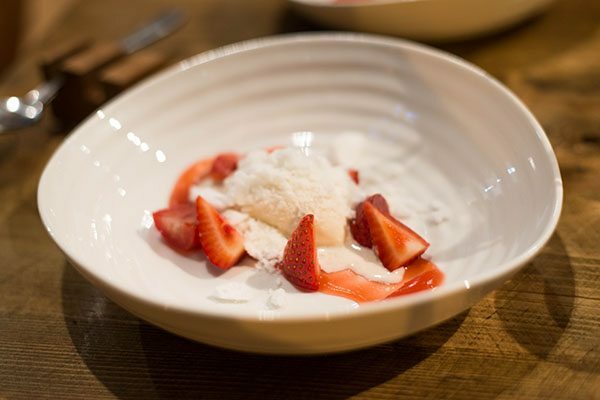 The milk foam is prepared in a way where when heating the milk, it turns like meringue which is brought to your table and sprinkled over your strawberries and ice cream. It has a light sweet milky taste, not chewy like meringue, more melt-in-the-mouth. The ambrosial strawberry sauce boasted strong flavours, pure strawberry heaven with a slight tartness, perfect with the creamy honey flavoured ice cream and a crunch of milk foam! 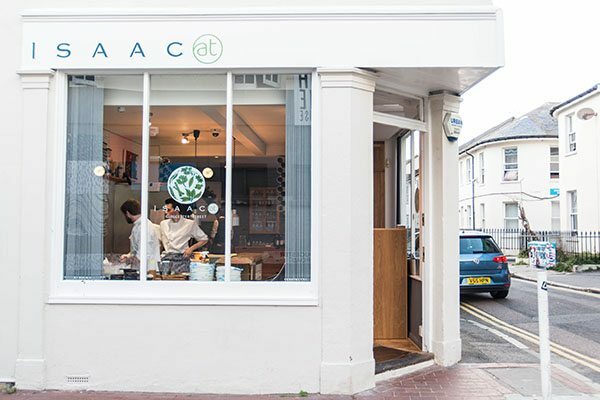 I would say my dining experience at Isaac At has be one of the best I’ve had in Brighton, and the food was amongst the best I’ve had anywhere! I would highly recommend going here both for the food and atmosphere, the staff are all really welcoming and can answer any questions you have regarding the food. The food is exceptional (I really can’t gush enough about the food! ), and I love the ethos of Isaac At. 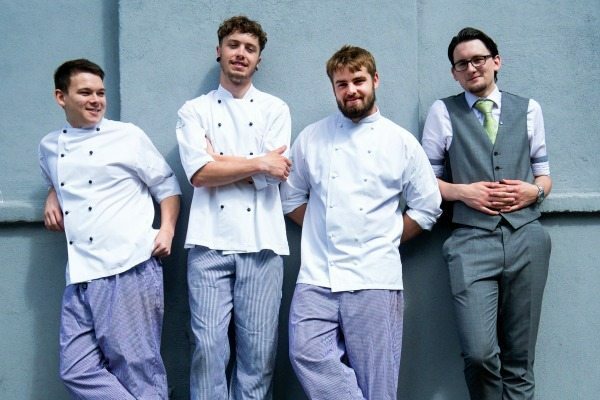 It’s really great to be surrounded by people who are evidently so passionate about food and giving their diners an experience to remember! Open Tuesday, Wednesday, Thursday, Friday and Saturday evenings 6.00pm to 10.00pm. Open Saturday lunchtimes 12.30pm to 2.30pm.